Mr Rooter Tip Of The Day: A clogged bathtub drain can be caused by hair and soap. Mr Rooter describes two typical bath drain assemblies and shares 3 easy tips to unclog the bathtub drain. Auger the waste line by passing the snake or hand powered auger down through the tailpiece and past the sanitary tee until the clog clear. Clumps of hair and soap sludge are the most common culprits in shower and bathtub clogs. “Shower drains are fairly simple to clear, since you just remove the drain cap and then auger the line,” according to Bob Beall, president of Mr Rooter Plumbing Pittsburgh and Youngstown. Bathtubs, on the other hand present a real challenge because of the mechanism used to stop up the drain when filling a tub. “There are two basic types of these mechanism: One uses a stopper and is remotely activated via a trip lever, much like the pop-up mechanism of a typical bathroom sink. The other type uses a rod-and-bucket assembly to stop water from draining out of the tub. “The rod-and-bucket type is the most common,” according to the most referred plumbing and drain specialist, Mr Rooter. A two-piece adjustable rod that fits inside the tailpiece attaches to a trip lever via a clevis pin on one end and supports the bucket on the other end. When the trip lever is activated, it lowers the bucket into the tee, blocking the flow of water coming from the waste elbow. “It’s probably no surprise that this rod-and-bucket assembly has a well-deserved reputation for catching hair and soap to form quick clogs. This is why the first step in unclogging a bathtub is to remove this assembly,” says Beall. Tip #1 Remove the trip lever. To remove the bucket-and-rod assembly, first remove the trip lever by unscrewing the screws that hold the trip lever to the overflow. Tip #2 Pull out the lift rod and bucket. Then pull out the bucket-and-rod assembly. Quite often a hair ball will be discovered wrapped around the bucket. If the water flowed down the drain when you pulled that out, that is plumber’s luck. If removing the waste and overflow linkage didn’t clear the clog, it’s time to pull out the plunger. Make sure there’s sufficient water in the tub or shower to completely cover the rubber cup of the plunger. Block off the overflow tube with a damp rag, and plunge with a series of sharp, hard strokes. Continue until the drain is cleared. Tip #3 Auger the waste line. If plunging didn’t work, an auger will be needed, inserted into the overflow drain. Start by augering the waste elbow. Then auger the waste line by passing the snake or hand powered auger down through the tailpiece and past the sanitary tee until the clog clears. Mr. Rooter Plumbing offers 24/7 emergency drain cleaning services: Call 877-ROOTER-2 and a licensed Mr Rooter plumber will be dispatched to your home or business immediately. President of the Pittsburgh and Youngstown Mr Rooter franchise, Bob Beall ‘s goal is to provide affordable costs to homeowners for any of the services they may need, many of which might occur unexpectedly. Mr Rooter coupons help to achieve this goal, as well as expert plumbing advice offered daily to homeowners. Mr Rooter prides itself on excellent customer service. Fast, courteous and front line services is what you should expect. We guarantee that is what you will get and our customers always know the price before we start. Established in 1970, Mr. Rooter® is an all-franchised, full-service plumbing and drain cleaning company serving 2.9 million consumers in the Northeast Ohio and Southwest Pennsylvania region. Recognized by Entrepreneur magazine among its “Franchise 500” and Franchise Times Top 200, Mr. Rooter® provides services to both residential and commercial customers. 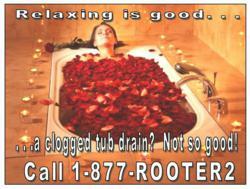 24/7 emergency plumbing repairs call 1-877-ROOTER2. For more information or to schedule an appointment, please visit our Web site at http://www.rooter2.com . Follow Mr Rooter on Twitter (https://twitter.com/mrrootermedia ), or like Mr Rooter on Facebook (http://www.facebook.com/MrRooterPittsburgh).